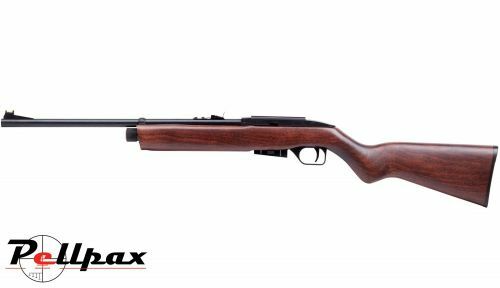 The Crosman 1077 is a fast and fun semi auto air rifle that fires as quickly as you can pull the trigger. Simply load up the magazine, load it into the gun and start pulling the trigger until the magazine is empty. The rifle has an approximate muzzle energy of 6 ft/lbs making it ideal for target shooting and teaching youngsters about safe use of firearms whilst still making it enjoyable. The rifle has a 9-11mm mounting rail on the top for additional optics, and is powered by one 12g CO2 capsule, which gives around 50 shots per capsule.